President Trump took a “get tough” stance in his address on the opioids crisis but a portion of his speech Monday was dedicated to prevention efforts. “The best way to beat the drug crisis is to keep people from getting hooked on drugs to begin with,” he said. That includes taking action on over-prescribing of opioid painkillers that fueled the crisis in the Ohio Valley region. The Charleston Gazette-Mail has extensively reported on small towns in West Virginia, such as Kermit, where drug companies shipped 9 million pills for 392 residents over two years. Animation of overdose deaths over time. Schuchat said the CDC will focus on improving data about over-prescribing. “Working with the clinical community and states to improve prescribing, using tools like the prescription drug monitoring programs,” she said. Schuchat said Kentucky is a model of success for these drug monitoring programs. Schuchat said Kentucky is a model of success for these drug monitoring programs. One of the strengths of the Kentucky All Schedule Prescription Electronic Reporting system is it is programmed to pull data from surrounding states. 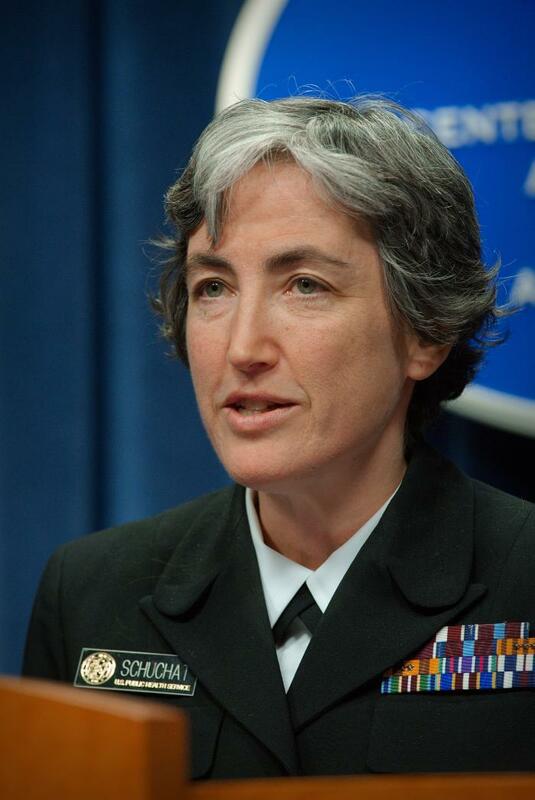 Dr. Anne Schuchat, acting director for the Centers for Disease Control and Prevention (CDC). “Certainly in the Ohio Valley so many people cross state borders every day that having information available to clinicians about neighboring state’s prescriptions will improve the safety of the prescribing for patients,” she said. Schuchat also sees a potential bright spot in data on emergency room visits. The agency recently began gathering data related to emergency room visits involving all opioid overdoses instead of just fatal ones. Researchers reported reported earlier this month that these visits were trending up nationwide, with some exceptions. Schuchat said the data can be used to develop programs in hospitals that meet people soon after they overdose, including naloxone training or adding navigators to the departments that guide people to addiction treatment. Meanwhile a new data mapping tool released this week shows just how deeply the region’s opioid crisis is intertwined with other social and economic challenges. 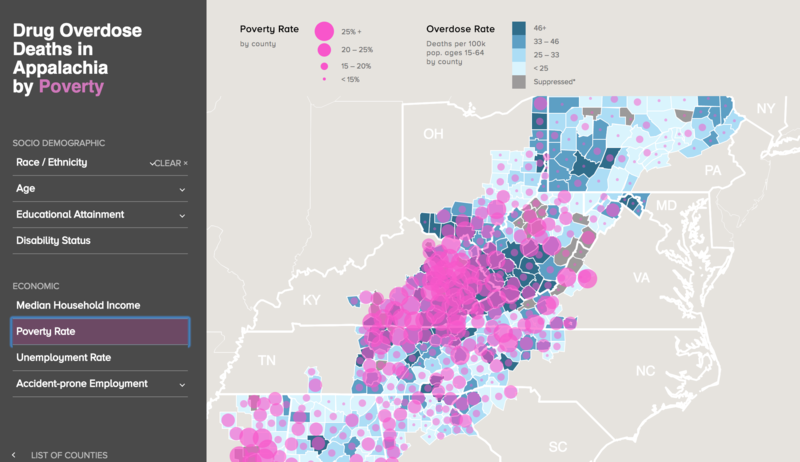 The Appalachian Regional Commission worked with the NORC at the University of Chicago to produce the Appalachian Overdose Mapping Tool, which shows hot spots of opioid overdoses in relation to other factors such as poverty, unemployment, education levels and disability. The mapping tool shows that many of the counties with the highest rates of overdose deaths also strongly correlate with the counties with the highest rates of poverty and people on disability and the lowest rates of educational attainment. The ARC and NORC data show that compared to the country as a whole, Appalachian residents are 55 percent more likely to die from drug overdoses, with the highest death rates in central Appalachia. A 2017 report from the ARC and the NORC’s Walsh Center for Rural Health Analysis, titled Appalachian Diseases of Despair, drilled down further into the statistics on overdose deaths by age group. In 2015, Appalachians in the prime working years of 25 to 44 years-old had overdose death rates that were more than 70 percent higher than for the same age group in the rest of the country. The CDC’s role goes beyond data gathering, of course. Schuchat said the agency will also be working in the region to raise awareness about the dangers of addiction to prescription painkillers. The advertising campaign shares stories of people affected by prescription opioids. Schuchat said she believes with President Trump’s announcement the CDC can expand this campaign and other efforts in the Ohio Valley.